This is the documentary that soldiers who have deployed to Afghanistan consider the closest you will ever get to the war zone without actually being there. 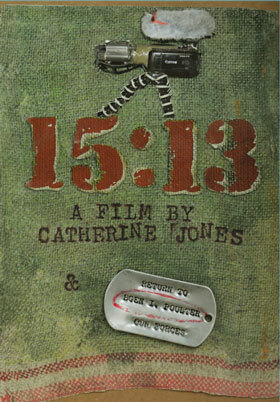 "If the word 'documentary' makes your attention wander, simply think of '15:13' as a war movie. It is a movie from the front. It shares the life of the soldier--the rations and rocket attacks and horseplay and tough work, and always the bravery and comradeship in a place where life is a matter of life and death. It puts you in a fascinating place in fascinating ways. And no special effects. This movie is exactly the real thing." An amazing, down-to-earth and revealing film. I particularly like the way the filmmaker is a background 'ghost', which allows the viewer to experience the real Afghanistan from the soldiers' perspective. "The Hurt Locker? Fake. Hollywood has got it so hyped up that if you throw a grenade the size of a baseball, it'll level a building. It's just not true. '15:13'? The real words. The real people." "15:13 truly reflects the realities on the ground--not the simple blood-lust depicted in Hollywood, but the intricate camaraderie between soldiers. This is 'their' story." "15:13 is real reality-- as opposed to Reality TV reality. Not fake like The Hurt Locker. Anyone who doesn't get 15:13 needs to spend some time in Afghanistan." "15:13 captures everything I know and hold dear about soldiers. It is rough-and-tumble like them and tells the real story: who they are, what they do, how they feel and what makes them laugh, and why they are there. I guess the best word to describe it all is moving. If you know anything about soldiers, this movie has captured their souls and tells it how it is." Purchase price: $30.00 each, includes shipping. Your order will ship within 3-4 weeks.